In 2001, Jason Hu took over as mayor of Taichung City. In keeping with his insightful perspective that a city’s unique characteristics and competence are ideally expressed through its distinctive cultural developments, Mayor Hu proposed the construction of a large-scale outdoor Amphitheatre in a park, combining greenery and culture. It was hoped that such a project would help develop Taichung into an international city of cultural and economic significance. This proposal finally bore fruit in August, 2006 after negotiations between and efforts by numerous parties. In 2008, construction of the Amphitheatre’s roof began. The project included the development of landscaped green areas with specifically-designed multi-purpose sections. 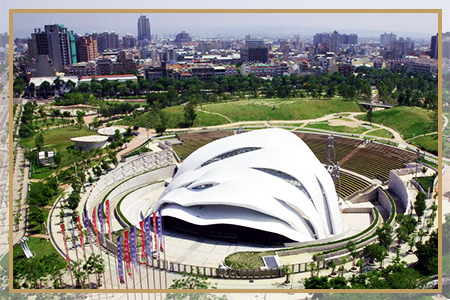 Mayor Hu named this the Wen-Hsin Forest Park, managed by the Taichung City Government Department of Construction, while the Amphitheatre was given its “Fulfillment” name and is managed by the Taichung City Cultural Affairs Bureau. The built-in Amphitheatre stage is an open performance space ranging between 40 and 51 meters wide. The stage has a length of 18 meters and is covered by a roof that ranges in height from 9.5 to 11.5 meters. The 363.638 square meters backstage area is constructed with three concrete layers, with steel used in the middle layer. The whole facility covers 816.5326 square meters and has 6,036 general seats, plus 20 seats for the disabled, distributed among three floors. However, the surrounding grass areas mean that audiences of up to 15,000 people can be accommodated. Since August 5, 2006, a wide variety of artistic and cultural events have been held here, with only exception being the year when the Amphitheatre roof was being constructed. This public space has not only provided a venue for top-quality cultural and recreational activities in Taichung, but has also helped to encourage the general public’s participation in arts and cultural events. Clearly, the “Cultural Economy” concept has seen the successful development of Taichung’s cultural innovation industry and transformed it into an “Oriental Vienna”. The size of this facility is about 8.86 hectares. Located in the city’s Nantun District, it is in the vicinity of the fifth and seventh redevelopment zones, and can be conveniently accessed via Wenxin Road, Xiangshang Road, Section 2, Dadun 7th Street and Huiwen Road, putting it less than 15 minutes away from the Taichung High Speed Rail station and national freeway network. The Daxin Elementary School, China Telecom Building, Huiwen Flower Market and a large number of trendy, exotic restaurants are all within easy walking distance. This convenient transportation network and ease of access have undoubtedly made this neighborhood a top residential choice in Taichung.